It is a topic that few folks like to talk about, but the truth is you cannot do without the best RV toilet. All RVs have toilets yes, so what makes one more efficient than the other? The difference lies in the mechanism. A good set up determines how effective the toilet is flushing. Since this is an important topic, you need to be prepared before you head out for that long road trip. I spend a considerable amount of time in my RV and have tried lots of portable toilets, and the following are the ones I can truly recommend. Check your RV toilet system and learn how it works. If the water pressure isn’t strong enough then you might benefit from a new one. There are a lot of factors to look into, but the wastewater and freshwater capacity are the most important. Portability, number of flushes you can do and weight also come into play. Quality portable toilets also keep odor and leaks at bay. The easy to install Camco toilet comes in a 2.5 gallon flush tank or removable 5.3 gallon tank. Made for RVs, the toilet is made from solid materials and can be used on boats and during other outdoor activities. 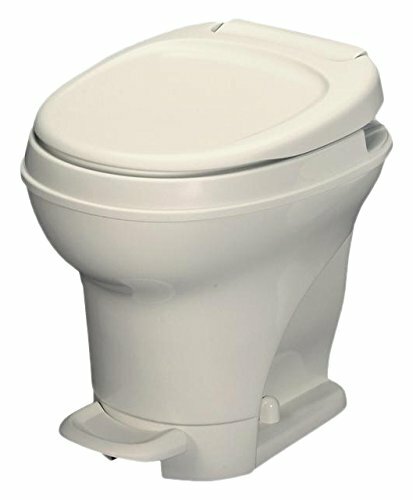 The flush is of the bellow style and latches on the side ensures the toilet is always secure. Odors and leakage are common problems with toilets but not here as the slide valve prevents both from occurring. The Camco is constructed from polyurethane so it’s sturdy and lightweight. It supports up to 330 lbs but it only weighs 11 lbs. Its light weight and compact dimensions – 16.38H x 13.75W x 16.13D inches – make it ideal for RVs. With the upper half of the flush tank you get a freshwater capacity of 2.5 gallons, and the its waste holding storage is 5.3 gallons. The upper and lower tanks have handles for convenient transportation. For RVs and camping in general, you’ll need a comfortable and portable toilet, and that is exactly what you get here. The Aqua Magic V is built for all types of motorhomes, combining the classic look with a higher profile for a more comfortable seat. The Magic V also sports a single pedal design for easy use. Press halfway to fill the bowl with water, and press completely to flush. The Magic V has a powerful flush for full bowl coverage. The toilet seat is comfortable and it feels like the typical home toilet. The lid is well-designed and resistant to scuffing so no need to worry about maintenance. Installing the Magic V is easy enough as is servicing. And with its single pedal system you don’t need to flush repeatedly. One of the more noticeable things about the toilet is it is higher than the average. This is the reason why a lot of people like it since you’re not squatting. The toilet is overall, well constructed and ideal for motorhomes. From the installation to the flush and comfort level, this is one of the better toilets you can buy. 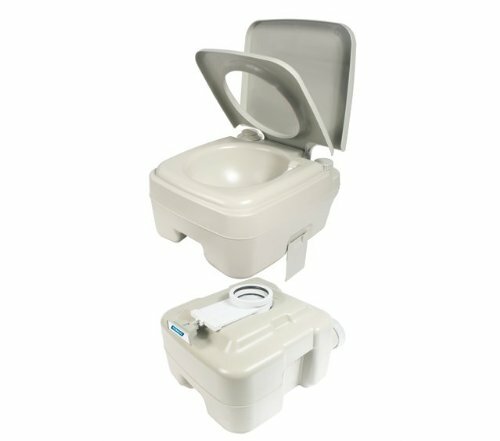 The Nature’s Head Composting Toilet is suitable for RVs, boats and anywhere you need a reliable toilet. The Nature’s Head was built to withstand difficult environments. If you get stuck in a place minus electricity and plumbing this toilet will get the job done. And as many customers have pointed out, this toilet is very durable and dependable. Nature’s Head toilets are mostly used on RVs but they’re just as good on trucks, yurts, barns, workshops and cabins. There is a low volume circulation fan integrated in the toilet which recycles the air so the air around the toilet smells good. It is this fan that keeps the odor at bay even with heavy use. Installing the toilet is simple enough and it is a nice alternative to holding tanks. Since this toilet is dry it won’t use up your water supply the way regular toilets do. If you spend a lot of time camping, a dry toilet is nice since you don’t have to worry about filling it with freshwater regularly. The Porta Potti is a favorite of RVers, but it is also as effective at home, cabins or anywhere you need a portable toilet. The toilet is leak proof, doesn’t emit odors and is sanitary too. Made from solid parts, the Porta Potti also has a one year warranty. The cover and seat are removable so cleaning is quick and easy. Unlike other toilets this one does not need a lot of maintenance. The bellow type flush works well for this design, and you don’t have to do repeat flushes as it’s powerful. The Porta Potti is comfortable to sit on and is of good height. You don’t need to hunch over and installation will not take long. Aside from its use on RVs, the Porta Potti is also suitable for truckers as it is compact and light. 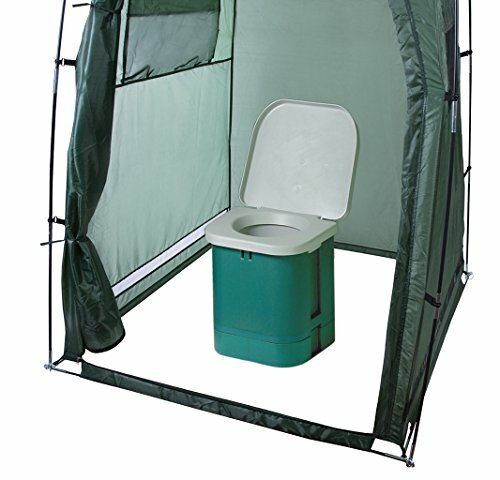 The toilet’s durable construction also makes this a useful – some say indispensable – addition to camping. The toilet is easy enough for kids to use and adults alike. Since the toilet doesn’t smell there’s no need for an air freshener. The SLCATL320 has 5. 3 gallon waste tank and 3.2 gallons of water capacity. The combination of this two allows for more than 50 flushes. The lightweight design of the toilet means it’s also easy to dispose of when filled. Flushing power is excellent as freshwater is used to rinse and flush the toilet. Since the SLCATL320 doesn’t require power or water connections it makes for a good companion when camping or you’re otherwise spending time outdoors. The SLCATL320 is built for use on the outdoors and RVs, which is why it is resistant to corrosion. Nobody wants to deal with a rusty toilet in the middle of nowhere so durability is a major plus. The capacities of the waste and water tank are better compared to other toilets in this range. The tanks are easily accessible so cleanup is a breeze. With its piston pump flush and rotating pour spout, you’ll have no trouble emptying a full tank. The toilet also doesn’t produce odors or leaks. The Porta Potty is made of heavy duty polyethylene that’s also easy to clean and maintain. The toilet is pre-assembled so no need to put any parts together. The high density polyethylene also means it can handle varying weather elements with ease. The toilet has a side valve which opens easily for waste disposal. It shuts tightly as well so foul smells don’t escape from it. The seal is watertight too so there won’t be any problems with leakage. While you can use deodorizing tablets it isn’t necessary in most cases. The waste water tank has a 5 gallon capacity and the freshwater tank 3 gallons, so it’s going to take a while before refills are needed. You can do anywhere from 50 to 70 flushes so it’s easy to manage. The durable construction of the toilet means the toilet can handle the rigors of RV use. It is also the ideal companion when on a boat trip, hunting or fishing. On/off caps also simplify emptying of tanks. 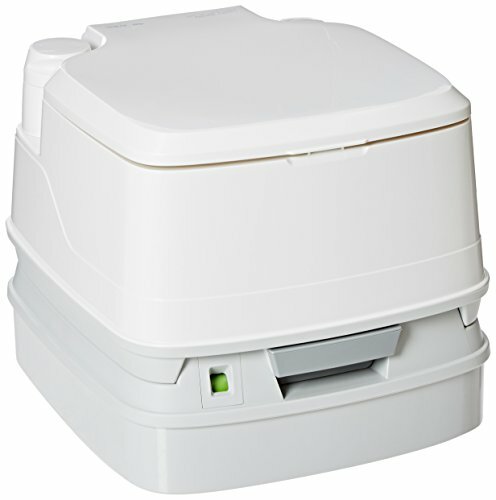 The 273-100 is a portable toilet that comes with the features and comfort of home toilets. The toilet is made from durable plastic that can handle travel and use in RVs, camping and many types of outdoor activities. The biggest complaint with portable toilets is the small seat. That’s not an issue with the 273-100 as the seat is large and comfortable. Because it can support up to 350 lbs, capacity and durability are not going to be concerns here. The generous capacity means it’s going to take a while before emptying is required. This is precisely what campers and RVers need. It also helps the toilet is low maintenance and cleans quickly. The toilet height makes the seat comfortable to use. The sturdy built is nice and isn’t thee type that would topple when bumped. If you’re a regular camper and looking for a convenient way to handle calls of nature, the 273-100 is one worth considering. Another thing going for the 273-100 is it doesn’t even look like a toilet. Toilets are available in a variety of forms, shapes and sizes, but the following are the most common. These are similar to household toilets except they don’t come with a water holding tank. RVers use gravity flush toilets with a water holding tank and water pump, or an exterior water source. RV gravity toilets are often made of hard plastic though a few are composed of porcelain. Heights vary and they’re the most commonly used in RVs, with wide and narrow models available. A composting toilet does not consume water. Instead it separates the liquids and solids, with the area for the solids filled with coconut coir or sphagnum peat moss. After flushing you turn the agitator on to dry the solids and cover it. The liquids are stored separately and go into a septic storage. Composing toilets don’t smell and have good capacity. For one person it might last four weeks, longer if you don’t urinate in the toilet. These are easy to carry around and also the easiest to install. These are ideal for small eaters and single users as the capacity is limited. But it is simple to use and ideal if you travel alone and don’t dump a lot. The problem with portable camping toilets is you’ll need to take its waste tank out to dump it into an RV dumping station. This means you’ll see and smell the sewage, something you can avoid with a black tank. Many of these toilets also have a low profile. A cassette toilet has some similarities to portable toilets, the major difference being a cassette toilet is set in place. Cassette toilets are connected to a waste storage tank usually on the RV access door. A vacuum flush toilet has a macerating pump, and it pulls the bowl’s contents using a vacuum mechanism. Like the macerating toilet the vacuum toilet and a holding tank are separate. Vacuum flush toilets are popular because they’re portable and easy to use. A macerating flush toilet is equipped with blades and a motor. These components macerate the waste prior to disposing of it in the holding tank. The tank itself is separate from the toilet. A toilet in an RV has the same purpose as that in your home, as a way to relieve yourself when nature calls. That is their only function but it is a vital one obviously. Your RV comes with one but in many cases it doesn’t perform the way you expect it to. If you’re going to set up tent outside your RV then you may consider getting a portable toilet. So while the purpose is the same the style, size and design varies. 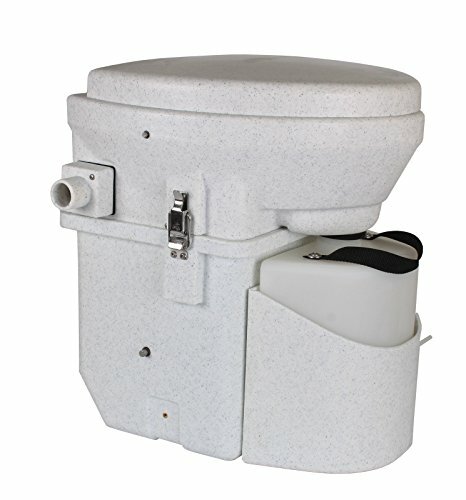 How to Choose RV Toilets? Now that you know the different types of toilets for your RV, the question is which one do you choose? We have already taken a look at the different types of toilets for RVs and the various pros and cons. Decide how, when, where you will use your RV and that should help you find the right toilet. Space is not the same as capacity. Here we’re talking about the physical dimensions of the toilet. It is important because space is limited in an RV so you’ve got to make the most of the space that is provided for you. If space is limited you may want to consider portable toilets or cassette toilets. They’re smaller but have a small footprint. That makes a huge difference if you’re the type who doesn’t like to waste space on an RV. No matter what type of RV toilet you buy you’ve got to take the construction into consideration. 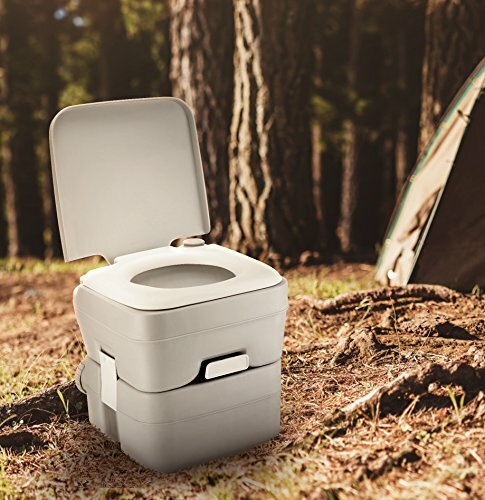 Get a toilet that is durable, made from hard plastic or other similar materials so it can withstand the rigors of heavy use in RVs or camping. The better constructed the toilet, the easier to handle it will be. Replacing your existing toilet in your RV should be a simple process if the toilet is well made. Most high quality motorhome toilets just require a couple of bolts and they’re good to go. The rule is simple, the more powerful the flushing mechanism the more effective it’s going to dispose of waste. Some toilets use a foot pedal while others have the traditional hand flush. Either way, just look for the one that has the maximum amount of power so repeated flushing won’t be required. We measure value by the longevity of its lifespan, the warranty, ease of use and how easy the toilet is to clean and maintain. These are all important even though we often take them for granted. The best value toilet is not necessarily the cheapest. Rather it is the one that is going to since you the best and in the longest possible time. That’s why there is more to finding the right RV toilet than just picking out the cheapest. The flushing system determines how hygienic the toilet is. If the toilet has a dependable flush system you don’t have to worry about leftover waste. In addition to the flushing system the toilet must have secure latches and seals to prevent leaks and odors from seeping out. These are not only unpleasant but can also cause bacteria to spread. If there is an unpleasant smell coming from the toilet when there wasn’t one before, look for signs of leaks. A feature rich, affordable toilet won’t hold any appeal to RVers if it is hard to install. A good RV toilet won’t take long to install and won’t require an expertise in engineering. The easier the toilet is to install the less likely it is going to cause problems later on. Portable toilets are easier to install than the bigger toilets, but as was pointed out in the various types section above, the larger toilets offer greater capacity. The choice is yours, but what is vital is that the installation procedure is straightforward. RV toilets don’t need a lot of features, and the more practical the design the better. The most vital feature is the flushing system. It should be powerful, easy to reach and does not wear off easily. The toilet must have a high capacity level too. This is usually measured in the storage for wastewater and freshwater storage. Capacity is measured in gallons and the higher the number the better. Do keep in mind the higher the capacity the heavier the toilet may be. The toilet must have secure latches so there are no leaks. Some toilets have sprays, spouts and carry handles. Others have detachable covers and tanks for easy disposing of waste and cleaning. Go over the product description and learn as much as you can about the toilet. The more amenities the better. 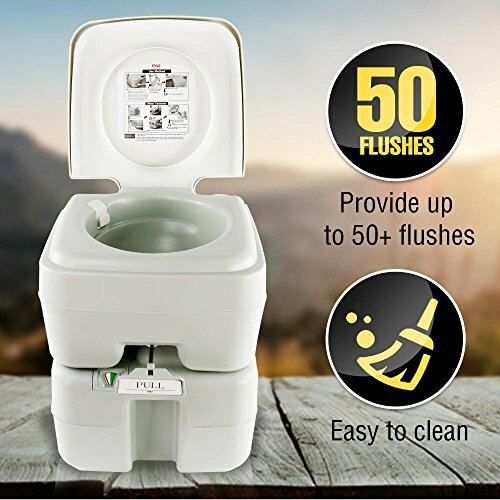 The main focus still needs to be the flushing system and how easy it is to dispose of the waste, but it doesn’t hurt to have a few extra features as well. Comfort is measured in two ways, the height of the seat and the dimensions of the bowl. Old style toilets have a low profile and you’ll end up squatting. This is not a comfortable position for most people so you’ll need to consider that. If you can get a high seat toilet that’s better. It is more comfortable and allows you to sit in a natural stance. You will no longer feel any pain in your back and you’ll be more comfortable too. The dimensions of the toilet bowl is another matter. Some like the bowl narrow and long while others prefer a wide, oval shape. There is no right or wrong here, simply a matter of personal choice. The length of use refers to how often you will use the toilet. This is directly related to how often you will use your RV, camping, hiking and so on. This will give you a good idea of what type of toilet you will need and the capacity. This is also a major factor in deciding what kind of toilet you will be needing. If it is just you, a single toilet, even the portable or cassette type, will do. If you’re going to spend time in the RV with family, you’ll need a large capacity toilet and maybe even a portable one for the kids. The more people there will be who will use the toilet, the greater the capacity must be. It is as simple as that. In case it isn’t obvious yet, toilets for motorhomes are versatile, great not just for RVs but also when you’re hiking for several days. If it’s portable you can even take the toilet with you. With a toilet you don’t have to look for a facility where you can relieve yourself. You can simply go any time nature calls and you don’t have to worry that the toilet isn’t clean as it is you are the only one using it. Using a toilet is practical and eco-friendly. There are composting toilets as my reviews here indicate, and you can properly dispose of the waste tank. It is just better for the environment and for you too to have a toilet in the RV so you don’t make a mess with nature. I don’t have to tell you how uncomfortable trips can be if nature calls and you don’t know where you can relieve yourself. Now you don’t have to drive around your V, looking for a campground or other place where they might be a restroom. Now you can drive anywhere you want to go, knowing there is a toilet. The toilet is not a fun subject to discuss, but it is a must if you camp regularly or spend a lot of time in your RV. No matter where you go sooner or later you’ll need to answer nature’s call and it’s best to be prepared. With the options given here you should feel more at home no matter where you are.